I have traded my life of Tex-Mex and warm weather in Austin, Texas (yes I was raised on a ranch and no, George Bush is technically from Connecticut) for the gezelling city of Amsterdam to pursue my MA in New Media from UvA. Since graduating in 2006 with a Bachelor degree in Communication from St. Edward's University, I have thrown myself into the fast paced life of PR working at various levels across the technology and consumer sectors. Why new media? My professional interest in the program lies in understanding how new mediums and tools influence the communication landscape and why. In turn I hope to directly apply this "under the hood" insight to my PR approach. My personal interest is vested in exploring the latest and greatest that the internet gods have bestowed upon us. When I’m not accidentally mowing over pedestrians on my bike I enjoy all things music and travel related. My idea of the perfect blog would combine the finer things in life: sandwiches and Lil Wayne. 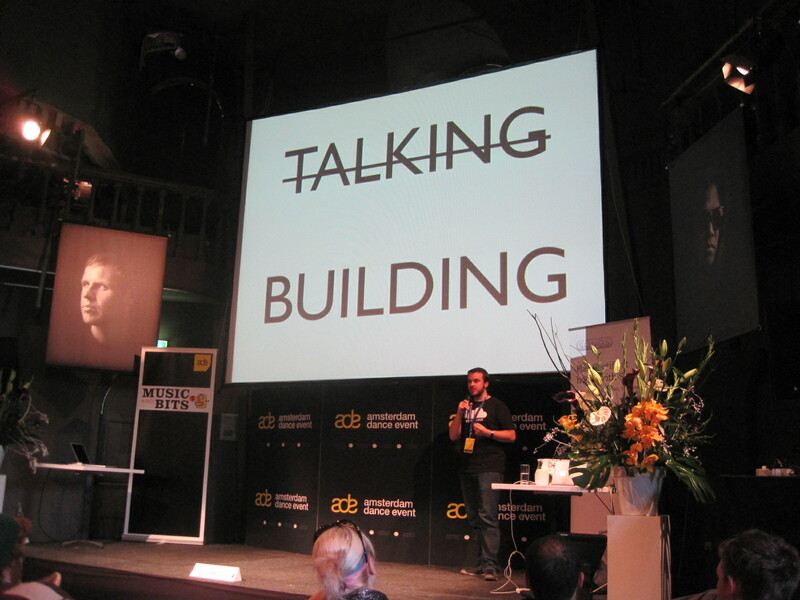 Last week I attended the Music and Bits conference, which is the pre-conference for Amsterdam Dance Event. The conference touts itself as “an exploration of music and technology” and by all accounts I would say that was accurate. Of the five companies who presented throughout the day there emerged two themes: App dev and marketing (for a separate blog post). EchoNest, SoundCloud and CreativeApplications.net all resoundingly delivered the message that app developers are crucial to the future of music. Having no real previous knowledge of what EchoNest is/does, Brian Whitman gave an engaging presentation on the importance of apps to the music industry. Although, I suppose this comes as no surprise since EchoNest’s bread and butter is app development. To visualize how quickly game changing applications can be developed Whitman gave an example of an app that was built in 24 hours that competes with streaming radio app veteran, Pandora. Except in the 24 hour time frame they were able to eclipse the current offerings of Pandora by including mood functionality, information on the bands from blog feeds, etc., and the ability to choose from round 10 million songs all done by algorithm. For reference, Pandora’s playlists are manually compiled from a list of about 700,000 songs. Whitman also demoed several other interesting applications, which you can check out here. In the same vein, SoundCloud and CreativeApplications.net both echoed (no pun intended) Whitman’s sentiment around app development and really encouraged developers to push the envelope with experimentation. For instance, SoundCloud has organized a series of events called “Music Hack Day” in different cities around the world. The idea is to bring together developers, hackers, programmers, etc, put them in a room together and see what they can create in just 24 hours. The results are often really impressive. All three companies embrace startups with respect to being startups themselves as well as creating platforms for other startups. Dave Hynes from SoundCloud gets excited about the experimentation phase of creating new applications (hence why he started Music Hack Day) and while I also think it’s cool to see what people create I’m not quite sure I get it. When does the experimentation leave the playground phase and turn into a business model? Or is this art for the sake of art? During his presentation, Whitman referenced a recent article from Mashable, Are Music Startups Destined to Fail? Obviously his answer is “no” but it’s a fair question. « Be afraid of Google?